Anti-fascist maps from a 1930s magazine. “Carriers of the New Black Plague,” William H. Cotton, Ken magazine, April 7, 1938. Click on the image to arrive at a zoomable version. Persuasive Cartography: The PJ Mode Collection. Cornell University Library’s Digital Collections. Ken magazine was the 1937 brainchild of David Smart and Arnold Gingrich, the publisher and editor of the then–four-year-old Esquire. Ken was published only from April 1938 through August 1939 and is most notable for having put several of Ernest Hemingway’s dispatches from the Spanish Civil War into print. 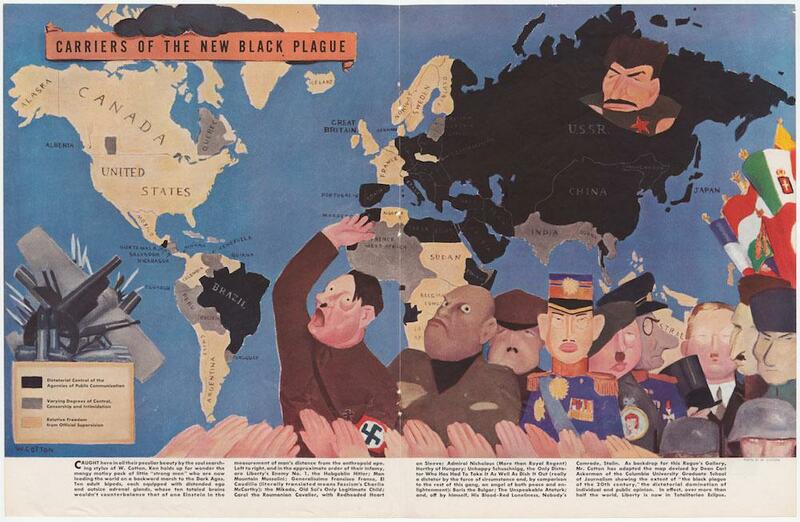 These three maps from Ken’s pages show Americans both feared and mocked worldwide fascism in the years right before World War II. Ken was founded as a leftist publication, bent on convincing Americans to support the Republican faction in the Spanish Civil War. But in 1938, Gingrich testified before the House Subcommittee of the Special Committee to Investigate Un-American Activities, where he vowed that Ken was both an anti-fascist and an anti-communist publication. “I would like … to point out that democracy in America is now on the defensive,” Gingrich said. “Anybody who can read without moving his lips realizes that democracies at the present moment are showing what looks like a case of sprained, if not a broken, back.” Gingrich went on to offer the committee evidence, gathered in the course of reporting pieces for Ken, of fascist activity in the United States. 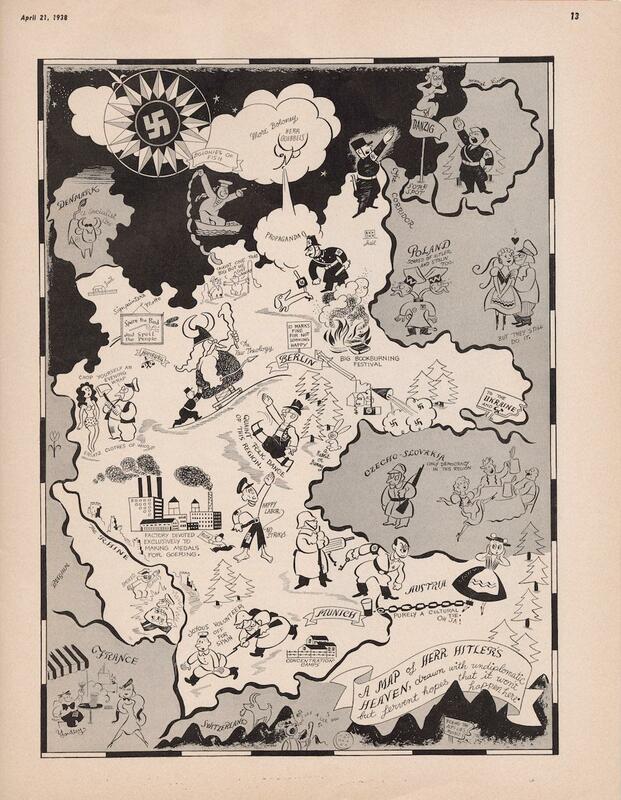 “A Map of Herr Hitler’s Heaven,” Richard Yardley, Ken magazine, April 21, 1938. Click on the image to arrive at a zoomable version. 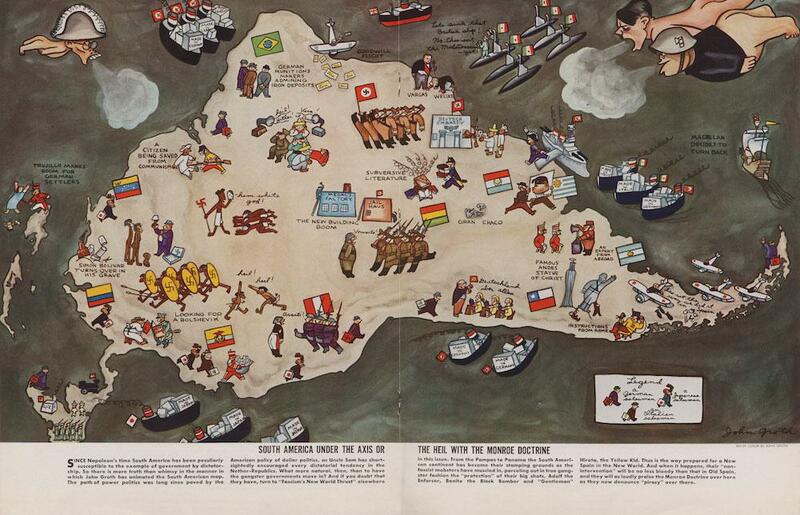 “South America Under the Axis or The Heil With the Monroe Doctrine,” John Groth, Ken magazine, April 21, 1938. Click on the image to arrive at a zoomable version. These scans come from the PJ Mode Collection of Persuasive Cartography, housed in the Cornell University Library’s Digital Collections. The site fulltable.com offers a few more samples of the pages of Ken.